Dragons in Greek mythology that may have inspired the constellation’s name include Ladon, the dragon who guarded the golden apples of the Hesperides. Hercules killed Ladon during his 12 labors; he was tasked with stealing the golden apples. 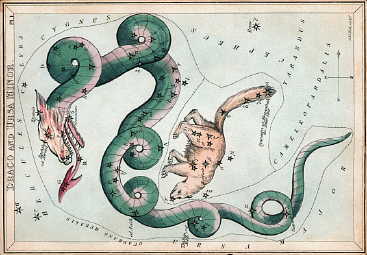 the constellation of Hercules is depicted near Draco. In Greco- Roman legend, Draco was a dragon killed by the goddess Minerva and tossed into the sky upon his defeat. The dragon was one of the Giant Titans, who battled the Olympic gods for ten years. As Minerva threw the dragon, it became twisted on itself and froze at the cold North Celestial Pole before it could right itself. Traditional Arabic astronomy does not depict a dragon in modern-day Draco, which is called the Mother Camels. Instead, two hyenas, represented by Eta Draconis and Zeta Draconis are seen attacking a baby camel (a dim star near Beta Draconis), which is protected by four female camels, represented by Beta Draconis, Gamma Draconis, Nu Draconis, and Xi Draconis. The nomads who own the camels are camped nearby, represented by a cooking tripod composed of Upsilon, Tau, and Sigma Draconis.